Even now some parts of the world are having heat waves, and we just don’t feel like eating something hot. But this cool curried cucumber salad will sooth the soul and cool the body. It’s quick and easy and it’s full of protein and has lots of great flavor. 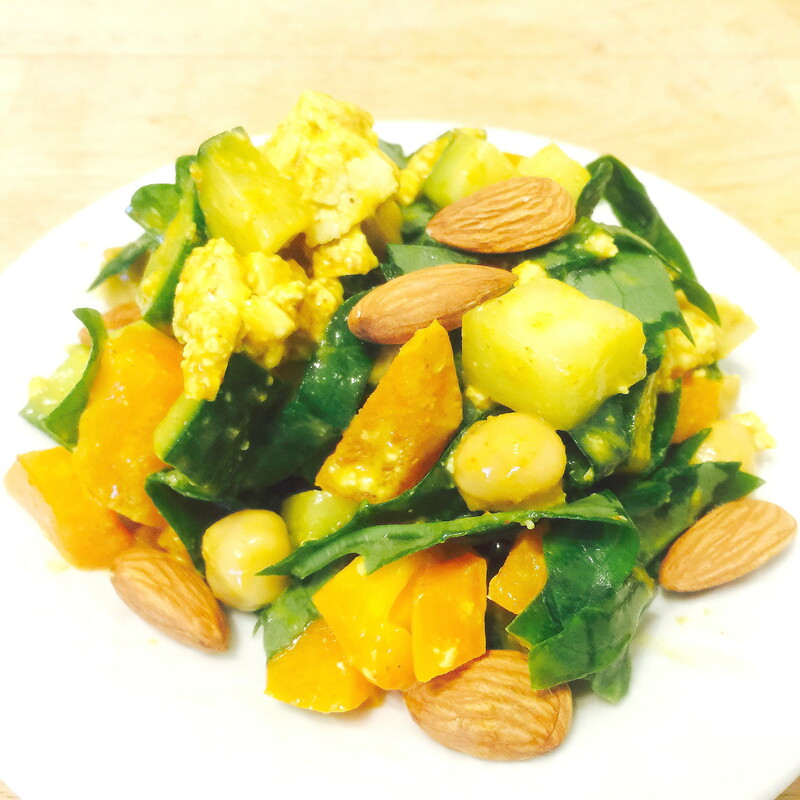 Great for lunch and dinner… this salad is packed full of nutrients and will do the body good… and lots of turmeric for healing. This recipe will feed 4 people or 2 that are really hungry. Turmeric grows in the tropics and has been used in India (Found in Curry Powder and Mustard) for over 2000 years. When cooked with cauliflower Turmeric has been shown to prevent cancer of the prostate and even stop the growth of tumors, and studies show that Turmeric stops the spread of cancer in lungs of mice. Turmeric has been show to reduce the risk of Childhood Leukemia and also prevent colon cancer… and new studies are being done on pancreatic cancer and Turmeric. Turmeric is a great detoxifying agent for the whole body and especially the liver… and studies show that Turmeric is beneficial in the treatment and prevention of Alzheimer’s disease. Turmeric is one of the best anti-inflammatory herbs you can buy, in fact it works just about as well as anti-inflammatory prescription drugs… and it also helps with pain. If a person suffers from urinary tract infections and cystitis Turmeric is great to sooth this away. Turmeric is wonderful for arthritis and also inflammatory bowel disease of any kind… and it also works wonders for people who have Cystic Fibrosis. And Turmeric lowers cholesterol, and improves liver function, provides protection from heart attacks and strokes. And if you like BBQing meat… then add some Turmeric because Turmeric lowers the carcinogenic chemicals created by charing meat. Turmeric is one of the best and least expensive wonder herbs on the market… and we can buy Turmeric anywhere. Turmeric can be taken in capsules, or Turmeric powder mixed with honey… or add it to food. This entry was posted in Healing Herbs and tagged Almonds, bell pepper, Cucumber, cucumber salad, Curried Cucumber Salad, Curry Powder, Dr. Paul Haider, easy, Fast to Make, Garbanzo Beans, garlic powder, Health and Wellness, HH, Honey, Hot Summer Days, Lots of Protein, Lots of Turmeric, Master Herbalist, Mustard, Organic, Paul Haider, Quick, Recipe, Red Pepper, Salt, Simple, Spinach, Stevia, Tofu, Turmeric Powder, USA, vegan, Very Cooling. Bookmark the permalink.